Sunday, August 29, 2010 \PM\.\Sun\. It is official the new translation of the Roman Missal will be released at the beginning of Advent 2011. I wanted to offer some of my thoughts on how the Church should address catechesis of the new Missal, especially catechizing on the Creed. In many ways the new translation of the Roman Missal is a vast improvement over the current translation, but its implementation will be one of the most challenging catechetical endeavors in recent decades. But in the midst of every challenge is a silver lining and I think the silver lining of this particular challenge will be the opportunity to reintroduce the faithful to the history of the Church, particularly the patristic period. Catechesis on the translation of the Nicene Creed should include a history of this Creed in order to better understand the meaning of the words we recite every Sunday. That being said let us focus on the new translation of the phrase, “consubstantialem Patri”. The current translation reads, “One in Being with the Father”, while the new translation returns to the more literal “consubstantial with the Father.” Naturally, this phrase refers to the relationship between the Father and the Son. Some preliminary observations to begin with: First, I think one of the key lessons from the controversy surrounding Nicaea and indeed from the entire study of the doctrine of God, is that we must be precise in our terms referencing God. It is amazing that the Fathers of the Church sacrificed so much just for just one word, like homoousios. If so much went into the use of term we should be careful not to throw it out lightly. Secondly, the term “one in being” is an ambiguous phrase. I remember when the US bishops were debating the new translation (unfortunately, I cannot find the transcript) this issue was raised about “one in Being”. Several bishops argued that “one in being” was not specific enough in describing the relationship between Father and Son, since you and I can be one in being in a room, etc. One in being in a time or place is not what the Fathers of the Church had in mind when they used the term homoousios/consubstantialem. Sunday, August 29, 2010 \AM\.\Sun\. The second in my series of posts in which I give rants against trends that have developed in society since the days of my youth, the halcyon days of the seventies, when leisure suits and disco were sure signs that society was ready to be engulfed in a tide of ignorance, bad taste and general buffoonery. 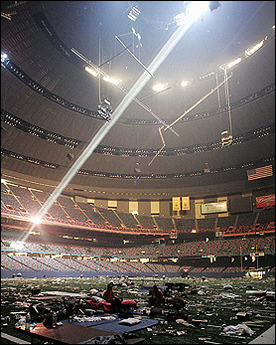 Today marks the 5th anniversary of the day Hurricane Katrina struck New Orleans. Many other commenters, far more versed in statistics and politics, will have plenty to say about the governmental failures in the disaster and the progress New Orleans has made in rebuilding. These are all very worthwhile, but as someone who lived in the New Orleans area before the storm, it’s not the story I think that’s most worth telling nor is it the one I’m most equipped to tell. While the government and insurance companies both reared their ugly and greedy heads in the aftermath, there’s only so much good one gets out of rehashing old arguments and injuries. I want to remember the good that God has done for me and the city from this storm. You are currently browsing the The American Catholic blog archives for the day Sunday, August 29th, 2010.